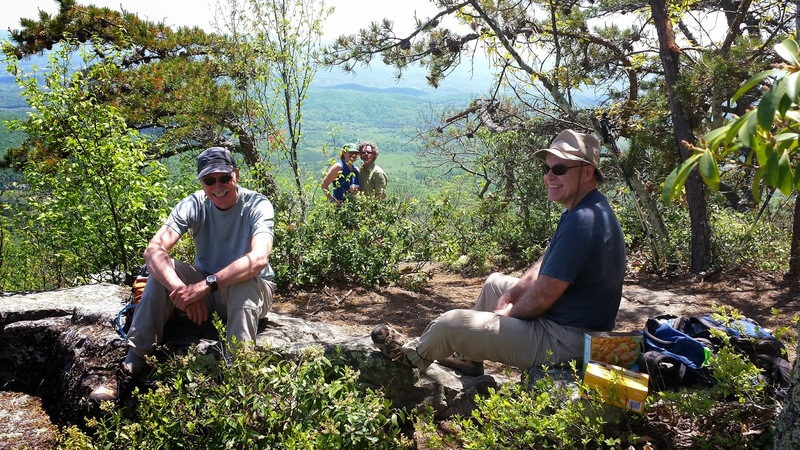 Tuesday hikers Scott Davis, John Brandt, Dave Borszich, and Marit Anderson (leader) met up at Wintergreen Resort to hike the Perimeter Trail on the east side with legs on the Pond Hollow Trail, Fortunes Ridge Trail, Brimstone Trail, and Blackrock Trail. As folks can attest - these trails are not easy, but rocky, steep, and arduous. We only managed a 1.2 mph rate with 1,500 ft elevation change. Purple was the color of the day with Catawba rhododendron, spiderwort, and phlox in bloom, as well as rose azalea and mountain laurel. 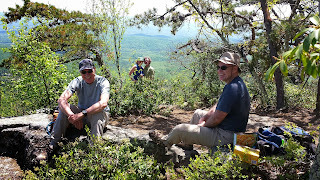 A waterfall along the Brimstone Trail provided a respite for snacks and cookies, and lunch was perched on The Plunge rock lookout. After five hours of hiking we decided to stay with the original plan and hike out at the shuttle car...not needing to add any more miles to our 5.3 mile total. Instead we enjoyed refreshments on Marit's current back porch on Fortunes Ridge. Quite a nice day...and hopefully we had no ticks or poison ivy after our trek! Nelson County beckoned eight hikers including Karen Rockwell and her pup- Gus, John Waits, CJ Woodburn, John Brandt, Leon Gorman, Brian Muszynski, Grace Neal, and Marit Anderson (leader).We started the morning with the cooler, Lower Shamokin Falls Trail along Stoney Creek with a 4 mile hike and then proceeded to the Rockfish Valley Trails to meander 1.3 miles along the Rockfish River. Temperatures were really picking up so a few folks took a dip. But the best antidote for parched throats was a lunchtime stop at the newly renovated Bold Rock Cidery. We enjoyed sampling the various hard ciders and staying cool under the shade trees on the back patio. It was a nice day of hiking, identifying wildflowers, and enjoying each others company. Grace had not hiked with our PATC group since a year ago, so we were especially grateful to have her drive from near Bedford to join us. Cheers! It was an absolutely beautiful day for hiker leader Kelly O’Rourke to lead the following hikers, many of whom have not done this hike before: Charles Staples, Jeanne Densmore, Dan Ralston, Dave Borszich, CJ Woodburn, Jodi Frederickson, Dave Abdallah, Brad Young and first time hiker Allegra Deucher headed off to Lexington, VA. According to the GPS tracker, we did ~9 miles with +2324 feet of elevation change. Most of us did both Little and Big House mountains. The sky's were clear and we could see miles away. We were lucky enough to see almost a dozen lady slippers, a super fat lizard and a goat! We were a little late to see Lee’s statue in Chapel Hall at Washington and Lee University, but enjoyed ice cream instead. On the way home we saw a guy on a motorcycle driving on Rt. 81 with his dog standing on a pillow in front of him, complete with doggles and what looked like a hat (to keep his hair from flying around of course!). 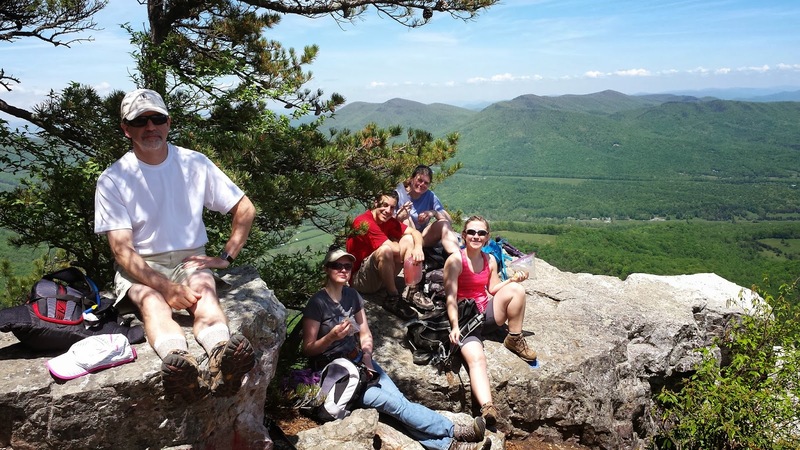 For the past few years, Alpha Phi Omega,Theta Chapter, a student service organization at the University of Virginia, has helped PATC maintain the Appalachian Trail. This semester’s event was rescheduled preventing Flying McLeods crew leader Mark Gatewood from attending. 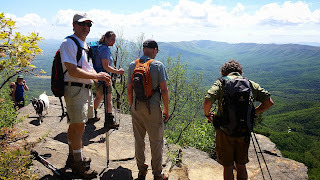 I said I could oversee the project, so on April 4 I went to the park, pulled some weeds and improved some trail drainage on the chapters section of Appalachian Trail at Rockfish and McCormick Gaps then walked up to Little Calf Mountain to see what would improve the trail. Al Dahler, a long term members of the Flying McLeods said he would deliver hard hats and trail overseer Andy Willgruber said he would join the group . On the day, just as two of us started on our way to meet the volunteers, APO called to say that some people had cancelled, so there would be a delay while they found some other helpers. While waiting for the students. Andy Willgruber went to Beagle Gap to finish some blazing which could not be done two weeks earlier because of the low temperatures, and found Al Dahler with a car full of hard hats and tools. We found a section of trail where the trail no longer had its original out slope, in part because a berm had built up. This is normal with use, when users compact the trail, and debris collects on the edges. The crew had done other trail work, learning the most important thing to do was avoid injury. 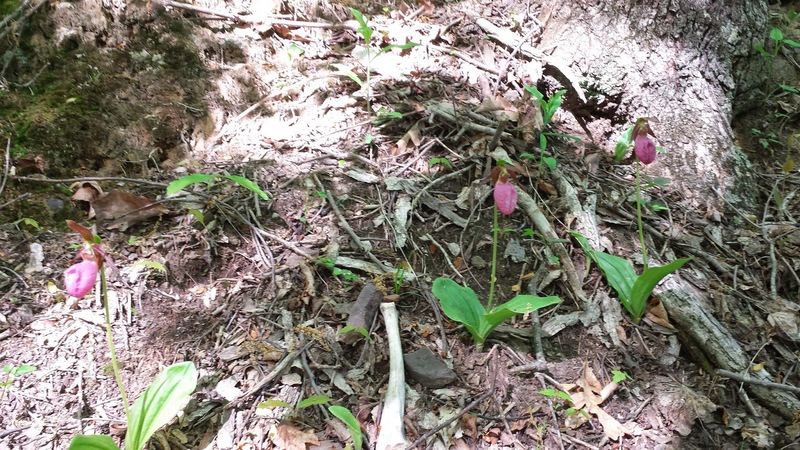 APO has also been helping slow bittersweet at Ivy Creek Natural Area for a few years. Although they did not mention regrading as something they had done before, they quickly did a fine job of correcting the slope, and even knew about scattering leaves on fresh trail to reduce splash erosion. We took advantage of these people with strong backs to move some rocks which obstructed a runoff we wanted to make. Because of their late arrival, the volunteers stayed later than they originally planned even though at least one risked being late for another commitment. As on previous occasions, the group impressed with their work and their commitment to service.